Most of our collection of Geoffrey Lefever’s work dates from around 1969 to 1971, the early part of his career. 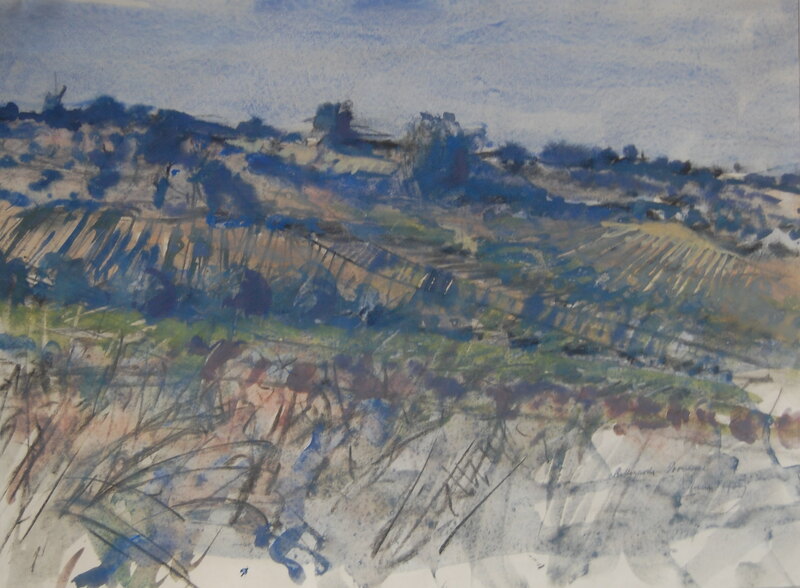 Many are inspired by the landscape of North Norfolk, where he still lives, as well as the Essex marshes and Provence. Bellgarde, the locality of this painting, is a Provencal village in Van Gogh territory between Arles and Nimes. Geoffrey spent the winter of 1969 in the region. These early paintings were all acquired in the early 1970s by enthusiatic collector Richard Cory Smith, who later gifted them to a friend in whose home they had been stored, all but forgotten, until we found them along with early works from Nicholas Barnham, Charles Duranty, and Cavendish Morton. Geoffey Lefever’s paintings today are almost entirely abstract, and he is more likely to be using a stick or straw than a paintbrush to create his finely textured works in acrylic mixed with ash, graphite and ground pigment. A professional engineer as well as artist, Geoffrey now enjoys pursuing both careers, and is equally at home restructuring people’s houses in Norfolk as creating and exhibiting his original and continually evolving art.